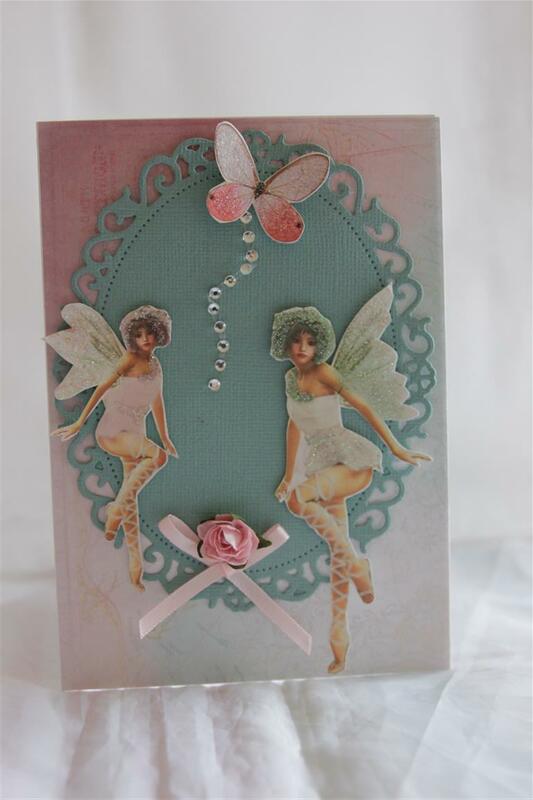 This one is so simple – kaisercraft enchanted garden ( a piece of one of the 12 x 12 papers) and some fussy cut glittery butterflies, with some bling strips, and a 5 minuter card done!quick post tonight as I am running a wee bit late with dinner1 til tomorrow…. going through my files i found some cards made some time ago that ( because of the christmas cards) I haven’t posted yet. So this week will be a tying up odds and ends week.Today and tomorrow is Kaisercraft enchanted garden. this paper was released a few months ago, and I did teach a class with it, where all my ladies diligently fussy cut a sheet of glittery butterflies. some were more diligent than others! 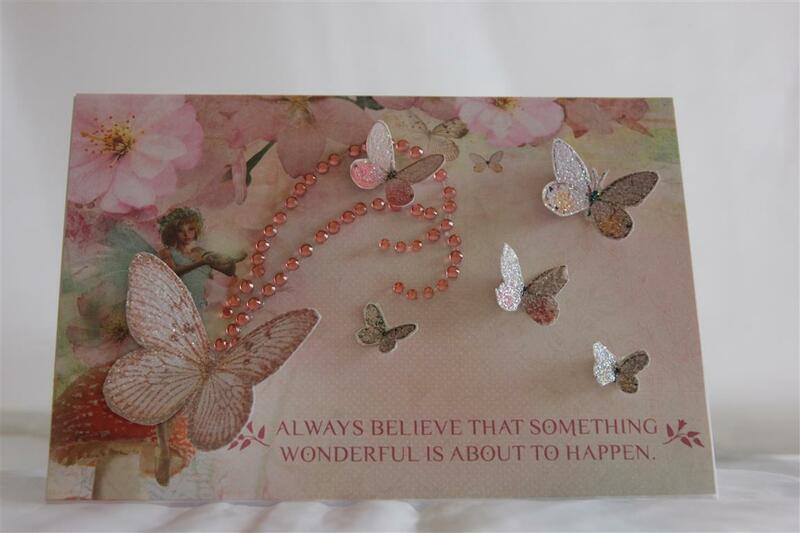 Thats where the butterfly on this card came from, and the fairies were on another sheet of glittery paper. The oval is a spellbinder floral oval die, and I added a ribbon bow, kaisercraft flower and some bling to finish. Til tomorrow…. This is the last card for now in my Kaisercraft Enchanted Garden series. All the pieces on this card were fussy cut from the 12 x 12 papers, the greeting was from the pack of matching collectables. I backed the frame with a rectangle cut from La Carta paper bubble – strawberry Mousse. I love the texture of this cardstock, and will invest in some more colours next time I am at my favourite papercraft store! Til tomorrow…. 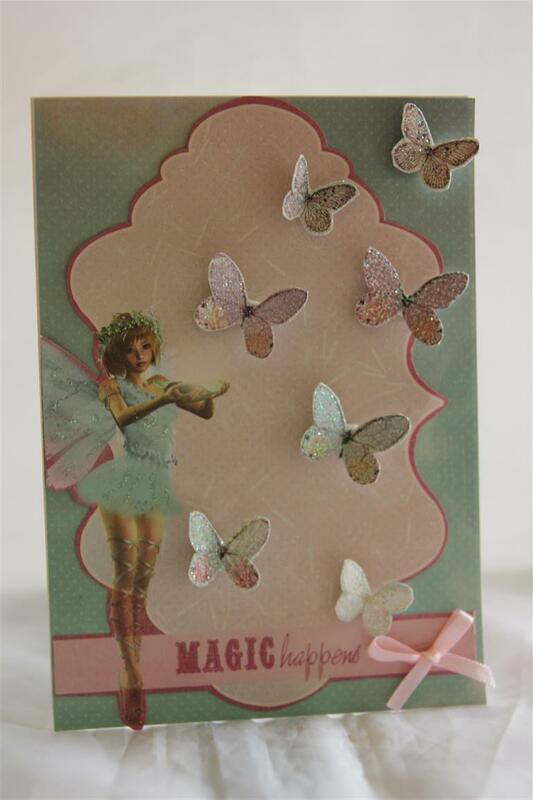 This one was very simple to put together – a piece of the 12 x 12 paper, ( kaisercraft Enchanted garden collection) lots of fussy cut butterflies, and a ribbon bow!i have organised my craft room for my christmas card makes, and have started on them today. I will take a break from them now and again as I have discovered lots of papers that I haven’t even cut into yet.. so many gorgeous papers, not enough time to play with them all…… til tomorrow…. 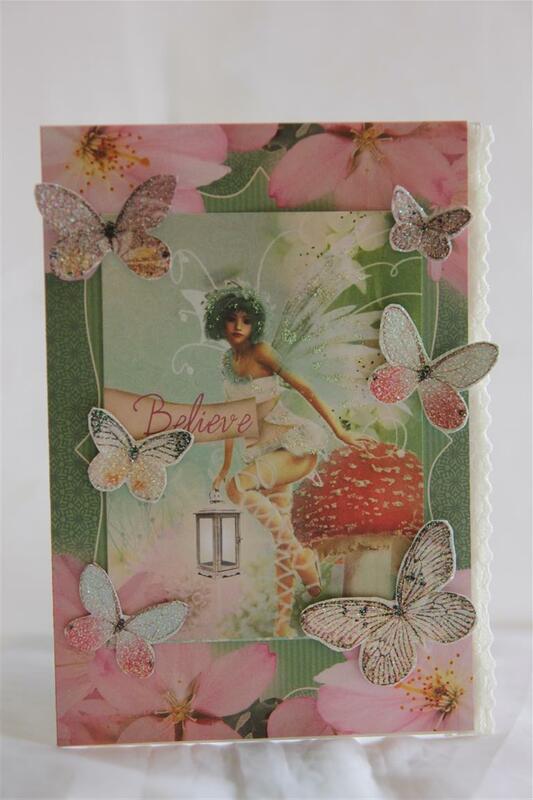 12 x 12 papers from the Kiaesrcraft Enchanted garden range, and lots of fussy cut butterflies from one of the sheets in the same collection. 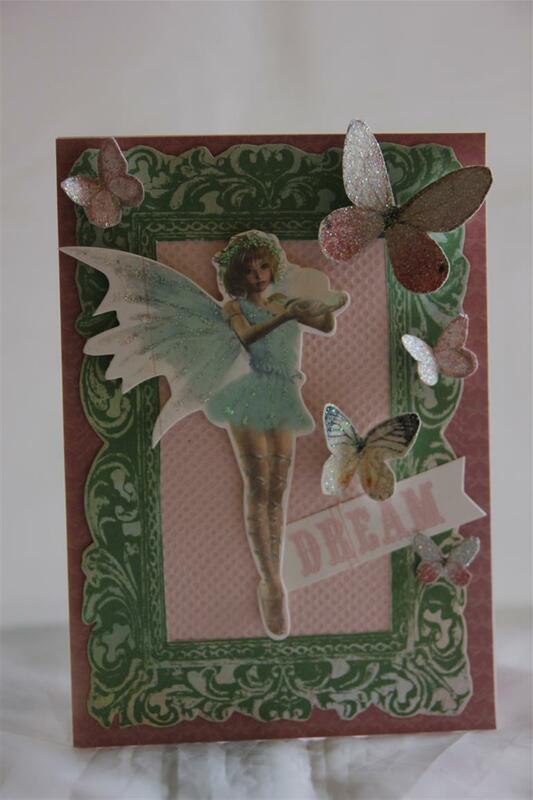 this butterfly paper is great as it’s all covered in glitter! I added a strip of lace down one side to finish. Til tomorrow…. Here is a bit of a change from all the christmas cards! 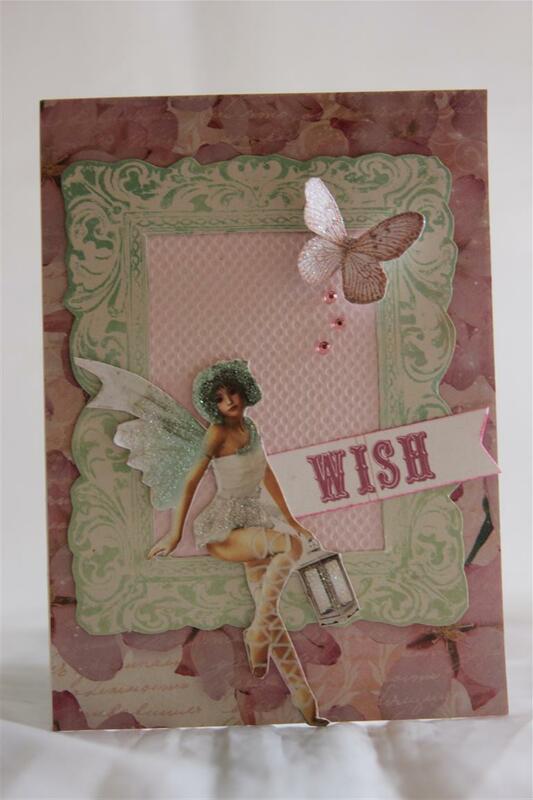 The paper collection is Kaisercraft Enchanted Garden, and here I have used the 12 x 12 papers, and fussy cut the butterfly, fairy, word and frame.The pink backing of the frame is something new – LaCarte paer Bubble – strawberry Mousse. It is a lovely cardstock with a bubble texture – I am a fan…busy in the craft room today setting up some lessons – one lesson down 2 more to go! til tomorrow….